Rep. James Langevin (D-R.I.) meets with George Gallego of New York Chapter and United Spinal’s president Joe Gaskins. NEW YORK, N.Y. – United Spinal Association and advocates from its membership division, National Spinal Cord Injury Association, gathered in Washington, D.C., on June 22-25 for Roll on Capitol Hill to shape policies that impact the health, independence and quality of life of people living with spinal cord injuries and disorders. Roll on Capitol Hill is United Spinal’s signature policy event that highlights key advocacy priorities for its membership and the broader disability community to ensure that legislators include wheelchair users and all people with disabilities in policy debates on Capitol Hill. “United Spinal’s 65-plus years of advocacy experience, combined with the energy and enthusiasm of our grassroots advocates, is a force to be reckoned with and provides our community a much needed voice at the policy table in Washington, D.C. Roll on Capitol Hill proves that together we can make a difference,” said Joe Gaskins, United Spinal’s newly appointed president and CEO. “This event is a tribute to the tremendous commitment of our members to get involved in policy change — not only in D.C. but in their home states,” said James Weisman, United Spinal’s senior vice president and general counsel. “We’re extremely thankful to all attendees and sponsors for making ROCH 2014 a resounding success,” added Weisman. During Roll on Capitol Hill, attendees took part in 200 congressional office visits, meeting face-to-face with their representatives and other key legislators to personally discuss issues critical to the disability community, including the need for better access to health care, social security benefits, disability rights, employment opportunities as well as accessible transportation. On June 23, ROCH attendees participated in a full day of policy briefings from advocates, agency officials and former Capitol Hill staffers. The day began with keynote speaker Claudia Gordon, special assistant, Department of Labor Office of Federal Contract Compliance Programs recently with the White House Office of Public Engagement. “It’s important to understand that individuals living with disabilities want the same thing everyone else wants — that is access and equality. We have to ensure diversity in the workplace and that includes wheelchair users and others with significant disabilities that are often overlooked. I applaud all of you for your hard work in promoting these principles and values,” said Gordon. Representative Al Green (D-Texas) received the 2014 VetsFirst Congressional Bronze Star Award for his efforts to increase opportunities for veterans living with disabilities to reintegrate into their communities. Representative Cathy McMorris Rodgers (R-Wash.) was presented with the 2014 Junius A. Kellogg Outstanding Congressional Leadership Award for her extensive leadership and vocal support of disability issues. Senator Casey, who introduced the ABLE Act of 2013 — which will help people with disabilities save private funds for education, housing, transportation, and employment assistance — thanked attendees for their efforts in gaining strong bipartisan support for this legislation. “The reason why the ABLE Act is on the verge of passage is because of you. Because of the advocates across this room and across this country who work night and day. You made it possible,” said Casey. “Thank you all for traveling to Washington to make sure your voice is heard. Each one of you has a powerful story to tell. 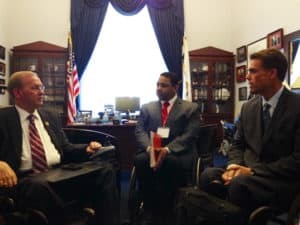 It is so important that members of Congress, House and Senate, hear from you directly about the challenges you face and the change you want to see,” added Congressman and wheelchair user Jim Langevin (D-R.I.). The following House and Senate legislators were recognized as ROCH Congressional Co-chairs for their sponsorship and leadership of the Ensuring Access to Quality Complex Rehabilitation Technology Act, HR 942/S.948, which improves access under Medicare for customized wheelchairs for individuals with significant disabilities. They include: Sen. Thad Cochran (R-Miss. ); Sen. Charles Schumer (D-N.Y.); Rep. James Sensenbrenner (R-Wis.); and Rep. Joe Crowley (D-N.Y.). United Spinal also honored several advocates who have been instrumental in policy successes throughout the year, including Arkansas member Kesha Pilot, who helped raise over $12,000 in support of ROCH and customized wheelchairs through United Spinal’s Save the Wheelchair crowdfunding campaign. Finn Bullers received the 2014 Advocate of the Year Award for his years of effective advocacy on behalf of people with disabilities, not only in his own state of Kansas, but across the country. For more information about the public policies that United Spinal addresses at Roll on Capitol Hill and throughout the year, click here.